Hot damn, it’s already that time again. I must admit, I was taken by surprise this year, I wasn’t counting on the Spiel des Jahres nominations yet. It’s a pleasant surprise, though. It always is. Lets have a look at the Spiel des Jahres nominees first, shall we? For a quick dice game with very simple rules, this one by Steffen Benndorf (published by Nürnberger Spielkarten Verlag) packs a nice bit of tactics. Each player has a scoring sheet with four rows of numbers, each row either ascending from two to twelve or descending the other way. After the active player rolls a handful of dice, each player may mark the sum of the two white dice in one of those rows. The active player may also mark the sum of one white and one coloured die in the row with the matching color. The catch? You may only ever mark numbers to the right of your previous marks, so once you skipped a number, there is no going back. And when you can’t mark any numbers, you lose points. It’s a very, very simple system, but you have to make interesting decisions. Antoine Bauza’s entry to this year’s Spiel des Jahres (published in Germany by abacusspiele), also goes in the category of “very simple rules, deceptively hard to play”. Hanabi (Japanese for fireworks) is a unique card game in that you hold your cards the wrong way round: you only see the backs, the other players see the faces. That’s not so bad, Hanabi is a cooperative game where your goal is to play all cards in orderly lines, sorted by colour and value. But to pick your card to play, your fellow players may only give very limited hints what your cards actually are, creating a very unusual deduction game. 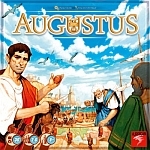 Paolo Mori’s Augustus (hurrican / asmodee) is a Bingo game about taking control over Rome. Yeah, you read that right, a bingo game. Each player has goal cards with different symbols on them. Similar to Bingo, symbols are drawn from a bag and both players may place a legion on a matching symbol on their goal cards. When all symbols on a card are filled, that card scores points and may trigger special actions. Unlike Bingo, Augustus is not a game of pure luck for various reasons: goal cards should be picked to go well together so you don’t waste draws, some symbols are more likely to be drawn than others and getting the best special action for your situation also plays a role. This year is a very tough one to predict for me. Not that my predictions were ever any good, anyway, but I still keep trying. All games have a very light set of rules while still offering interesting, tactical gameplay and are equally strong contenders for the award. Hanabi might have a slight edge for being the only cooperative game nominated, but on the other hand Augustus is the most thematic. Qwixx has a certain push-your-luck component to it that makes it very attractive to me. I can only take a guess this year, and my guess is Hanabi, simply for being a cooperative deduction game involving a lot of communication to reach your goal. It just seems like the sort of thing the jury will like. Good luck to all the designers and publishers, may the luckier one win because I don’t see a clear-cut better one.